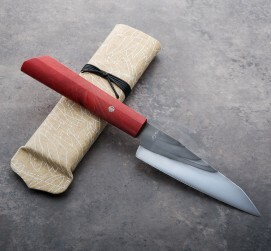 Don's Kiritsuke Utility chef knives are always in high demand, and this particular example, with a rare and vibrant piece of exhibition-grade Pink Ivory wood and a rainbow-quenched 1095 carbon steel blade, is as fine an example as there is. Expertly shaped convex primary bevel geometry formed by hand, with a very thin, gently curved edge in one of our favorite carbon steels makes for an heirloom-quality handmade knife that is not only built for daily use, but intended to pass down through the generations. At 5.57" (145mm) in a partial-tang, wa handle configuration, you will find no shortage of uses for this versatile blade profile. A cloth-covered transport case is included. 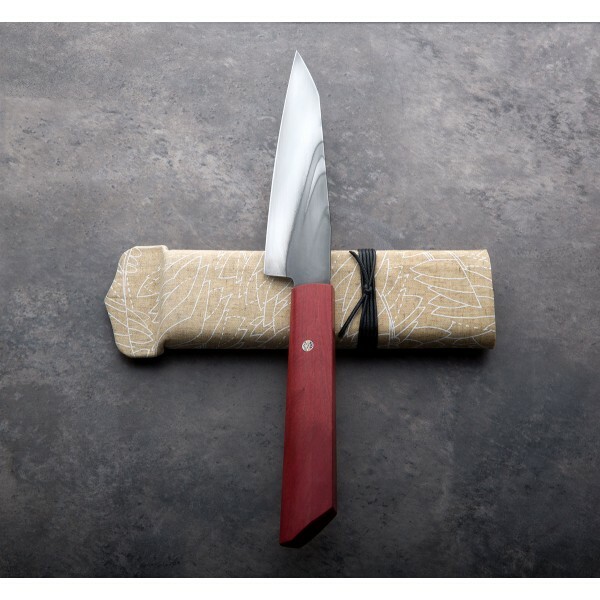 Don Carlos Andrade handcrafts custom chef knives at his one-man shop in Los Osos, CA, using decades of experience, intuition and passion to create some of the finest kitchen cutlery being created today. 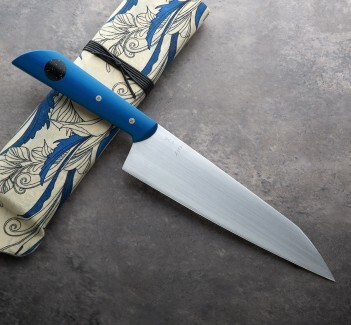 Formally trained as a chef, with subsequent time spent carving bronze and stone as an artist and over a decade of bladesmithing results in unique works of functional art that are built with purpose and crafted to an heirloom quality that Don hopes will bring friends and families together in the kitchen for an enriched and memorable cooking experience. 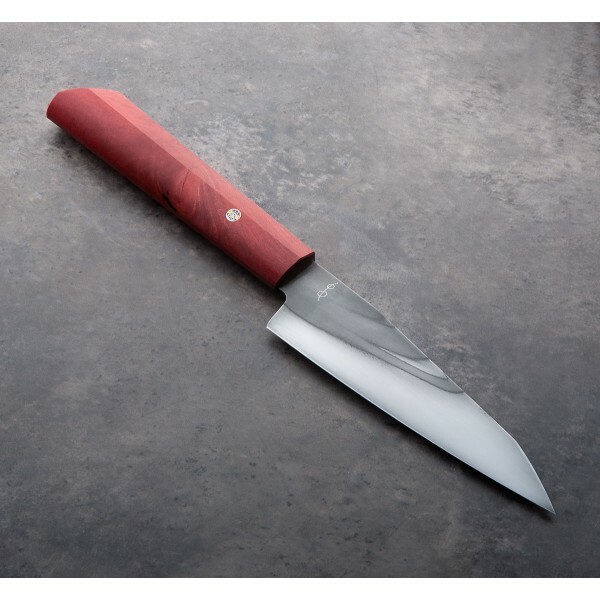 5.7" (145 mm) blade, 11.75" overall. Blade width at the heel: 2.75mm. Blade height at heel: 35mm. Weight: 4.4 oz (124 g). 1095 carbon steel blade with differential rainbow quench. Exhibition-grade pink ivory wood handle with unique mosaic pin.